Thank you to Janene Zaccone for recognizing our work in this article. These images are from the gallery opening with the kids from St. Joe's. 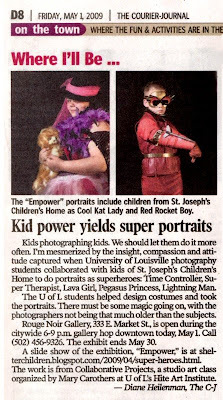 Come see the Super Hero series and several other photographs from our collaborations with St. Joe's kids at Rouge Noir Gallery on May 1st (Trolley Hop Night). Rouge Noir is located at 333 East Market Street Louisville, KY 40202. These may be even better than the first session! If you were a super hero, what would you be? 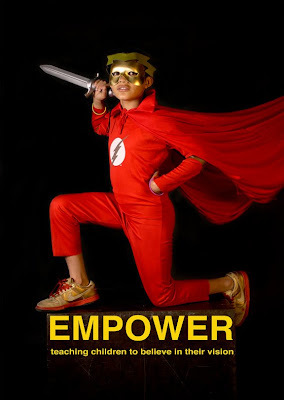 What powers would you have? Some of the children were inspired by existing super heroes and some created their own. The photography students worked with the children to design their costumes and take their portraits. The results were empowering for the children and the students working with them. The children were given cameras to shoot their own photographs. These are some of the results. With the children of St. Joseph's, we spent an evening drawing with light. Leaving the shutter open allows the camera to record the traces of light as they move across the frame. We "drew" around the children with colored flashlights, making them into fantastic characters. Collaborative Projects is a studio art class organized by Mary Carothers at the University of Louisville, Hite Art Institute. Projects for the class have been supported by a UofL SUN grant (Supporting Undergraduate iNnovation) an outreach-oriented partnership among at the university. Under the theme "Shelter" the participants in this class work on three collaborative efforts. One combines image and text in a union of visual art and poetry; each poet writes for the artist and each artist visually responds to the poets. These pieces will be displayed in bus shelters for the Transit Authority of River City, Louisville's public transportation system. The second effort empowers the voice of children through the teaching and mentorship of the class participants. The third combines these efforts in a multi-media exhibition. Together with the children of St. Joeseph's Children's Home, we create unique and inspiring pieces of art.